IF Zhang Ziyi is fire, Zhou Xun is, well, a block of wood. Unlike the introspective prince who suppresses his emotions, Daniel said he is an expressive person who has no problem displaying his emotions. For example, a few months ago, he and his Alive bandmate Terence Yin had a small fight on their blog over some video footage. He also expresses his frustrations by doing a physical workout. Said Daniel, who has been trained in wushu since young: 'I usually rely on exercise... Punching a sandbag is a good way to vent.' But while he is vocal with his buddies, Daniel claims to be 'stupid' when it comes to affairs of the heart. Daniel, who is reportedly dating Eurasian supermodel Lisa S, said that between two people, respect for each other is important. In the movie, his character's two lovers are both so besotted with him that they are willing to die for him. Ziyi plays his childhood sweetheart who marries his father and becomes the empress. So who does Daniel think is prettier, Ziyi or Zhou Xun? His diplomatic reply? 'Both are pretty, but they have their own appeal. 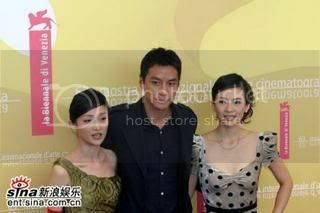 Ziyi sparkles, while Zhou Xun has more character and style. The Banquet opens in theatres here today.